The Michael addition is an organic reaction used to convert an activated methylene and a conjugated olefin to the corresponding addition product using a base catalyst followed by an acid work-up. The activated methylene is essentially a methylene bonded to electron withdrawing groups that would stabilize the negative change that forms after deprotonation by the base. This deprotonation results in an enolate which in turn does a 1,4 addition to the conjugated olefin. 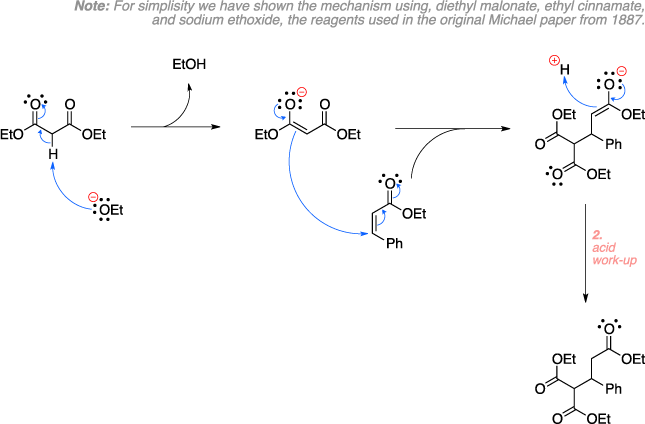 An acid work-up then provides the final Michael addition product. Michael, A. J. Prakt. Chem. 1887, 35, 349–356.